For some, the words "For Gnomeregan" is a reason to smile. For Brendan Main, it's a reason to start playing World of Warcraft again. Although it may not seem like it sometimes, Catcalysm is as much about creating things as it is about destroying them. Sure, the old and familiar will be swept away, but something fresh and new will take its place. In Issue 267 of The Escapist, Main talks about how one of these positive changes - and his love for gnomes - brought him back to World of Warcraft after more than a year away. I'm right at the outset of one of World of Warcraft's pre-expansion world events - the retaking of Gnomeregan, the fallen capital of the gnomes ... It's a mechanical Mecca of spinning cogs and whirring gears, a futuristic city of untold technological promise. A city that, if I had to be perfectly honest with myself, I secretly despise. [Gnomeregan] is pretty much it for the Gnomes - it's testament to their status as cosmic punching-bags of Azeroth that their content peaks at level thirty. The gnome's memorable /charge emote - "For Gnomeregan!" - is a bittersweet reminder that no matter where else you might go, Gnomer will always be unfinished business. [But] Blizzard's pre-expansion quest campaign to retake Gnomeregan casts the much-maligned capital in a different light. 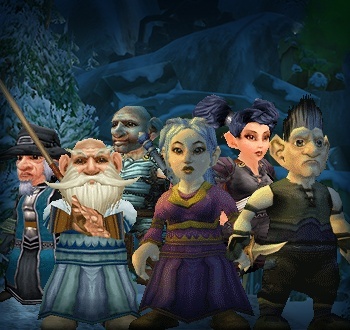 It proves that, even in the midst of world-changing crisis, Blizzard has time for a little bit of love for the little guys ... in a lot of ways, the thematic experience of Cataclysm isn't about heading outward, but coming home ... and now, finally, the Gnomes will have a home to come back to. Cataclysm will change more World of Warcraft than any other event or expansion before it, and as Main shows, it's not always the lava and evil dragons that capture someone's imagination. You can read more about Main's love of gnomes and his bittersweet relationship with their irradiated home city in his article, Gnomeward Bound.